I am 24 weeks pregnant now, so technically in my sixth month, and just now getting a chance to share my four & five month chalkboards. I know, get with the program right?! 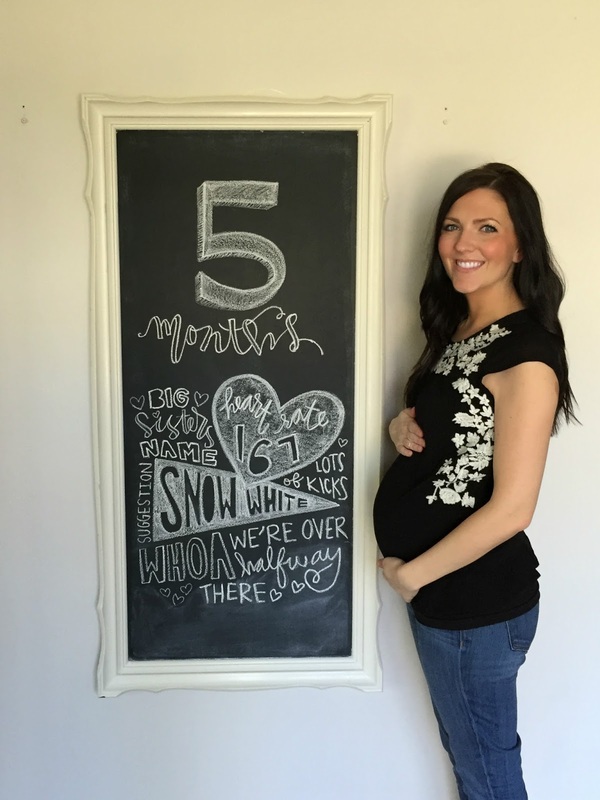 So before I share my six month chalkboard, here are these + a little update! Maternity clothes: Wearing mostly maternity clothes or comfy sweats around the house. Warm weather means lots of dresses, I am still loving my Andie Pants (pictured below) & grabbed a pair of maternity shorts on sale for summer (and most likely for post-baby belly as well). Best moment this month: Celebrating Harper’s 3rd birthday, and even though it was so bittersweet, it really makes me excited to know we have another brand new baby on the way to start all over again with firsts. Worst moment this month: Feeling overwhelmed as Brandon traveled a ton these last few weeks. I think kids at any age are going to have their challenges, but sometimes all of those challenges consume both kids & the walls definitely feel like they’re closing in! It is a constant struggle to balance parenting, spending time with Brandon when he is home, working, blogging, cleaning, having fun & anything else that is left, and when I think about adding another baby to the mix? My head spins a little. I think month five is always the freak out month, so hoping it will pass! Miss anything: Things are getting a little uncomfortable over here as the belly is getting bigger, making it hard to climb at the playground with the kids, lean into the tub to give baths, etc. and I definitely miss being able to do that all with ease. I could also really go for a margarita, I blame it on the Mexican food cravings & warm weather. Movement: Lots of kicks, flips & hiccups! Cravings: Lemonade, strawberries & Mexican food. Queasy or sick: Feeling good. Second trimester is where it’s at. My husband just started traveling a bunch for work and bedtime is especially exhausting for me. Hang in there! Girl we are both due with number 3 within the same week and it's like I could have written this! Month 5 was for sure freak out month for us too! I can't wait for more sweet newborn snuggles! The chalkboards look beautiful as always! It's going to be so exciting to have 3 little ones so soon! I love the updates! Doing monthly boards seems to be a much better idea with 2 little ones at home. Also, how cute to add Harper's name suggestion! That'll be fun for #3 to see one day. awwe! you look great! lol at Snow white! 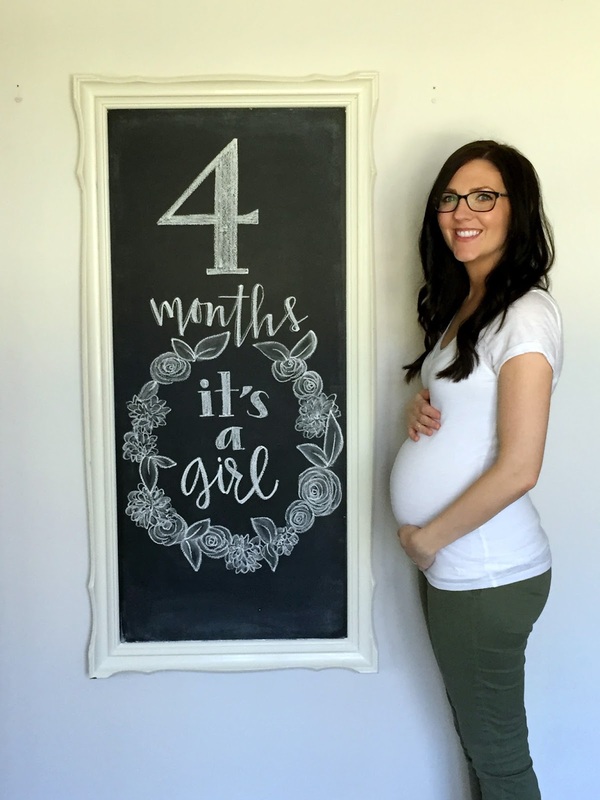 Oh, that "it's a girl" chalkboard is beautiful!! Man, I wish I was sleeping better, and mmm those cravings are right on point! When the bottle of Simply Lemonade in my fridge gets low, I start to have a panic attack! I'm pretty sure the naming gets harder each time around especially when the genders the same! Poor Baby Girl #2 wasnt named until the beginning of my 9th month, ha! Looking great mama! You are too cute! Where is the black and flower shirt from? I love your 4 Months chalkboard! SO pretty! I would have hated to have to erase that! Exciting. When I was pregnant with my third I had a number of freak out moments where I thought…aaahhh, what the heck have I done. My mom always says this too shall pass!!! Wouldn't change it, but man some days are REALLY REALLY hard. Have you been to Cans taqueria and Tequila bar in Milton? We went a few times when in Georgia and it was really good! All the food was spicy :))) and If I wasn't pregnant I would have been all over the pineapple infused tequila ! I was drooling lol I love margaritas!!! You're so cute and talented. It makes me sick haha. Love your bump update! Happy ST Patrick's Eve to you as well. Your chalkboards are as gorgeous as ever! Looking good mama! Can't wait to see the nursery inspiration. I haven't! We have big plans for a new Mexican place on Friday night & I am already dreaming of queso! Thank you! I always love the way flowers turn out. And if I don't erase it, Harper will certainly do it the first chance she gets! Thanks Chelsea! It is old from Piperlime, the brand is Sabine. Yes, I totally agree! And thank you! So much queso! 😉 And thank you! Your chalkboards are always so pretty! You look so cute in glasses. 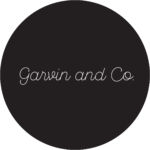 I just love your blog 🙂 thanks for sharing with us. Ha at Snow White! My youngest son was technically named after Thomas the Train thanks to his big brother wanting to help name him. We compromised and went with Noah Thomas, but he would've been Thomas the train if it were up to big brother! This is a totally random question, but have any of your girls slept with a white noise machine? If so, what is your experience with them? My 6 week old falls asleep pretty much instantly if we turn on the exhaust fan in the kitchen so I've debated whether or not to use white noise. I'm afraid she'll get addicted to it and have to have it wherever she goes and that she won't be able to sleep on the go. Your feedback is appreciated! You look so adorable in those glasses! And you've always been so pretty pregnant. I hope these stresses fade a little for you. I've only got one kiddo so far but I can imagine how stressful being out numbered would feel. Hugs! Looking beautiful mama, LOVE your chalkboards as usual. Love the name Miss Harper picked out for her little sister 🙂 You are looking gorgeous as usual! 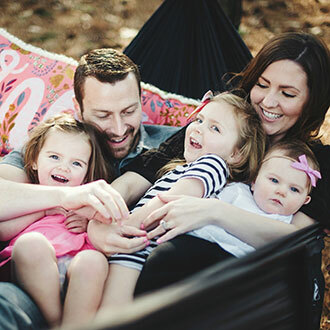 Love reading your blog and your daily adventures with your precious family. Hope you are having a wondering St. Patrick's Day! You look stunning! For some reason I think Norah would be perfect for baby #3!